This week’s craving for sparkle is devoted to none other than micropave engagement rings. These bedazzled diamond settings are perfect for adding bling to any engagement ring. If you need to add some sparkle to a ring to enhance its size, micropave packs a ton of glittering without a heavy carat weight. You can also use micropave to enhance a diamonds color, and to detract from and major inclusions – it’s a solution for each of the Four C’s. And this style of jewelry is flexible for any shape of diamond, as evidenced by this week’s picks. This beautiful round brilliant diamond is a 1.17 carat EGL Certified G color and SI1 in clarity. 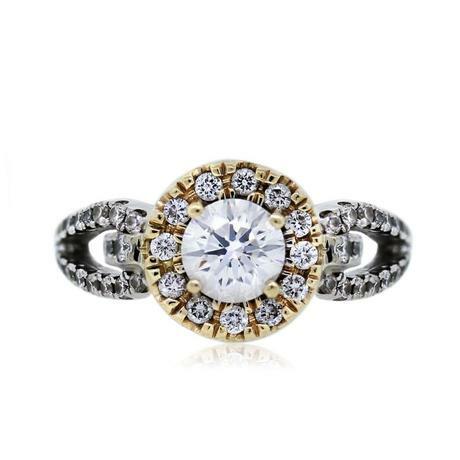 We’re obsessed with the white gold setting that boasts approximately .50ctw of round brilliant pave in an antique style. The circle around the center stone makes it look larger and the accents on the shank give the entire ring a more intricate appearance. 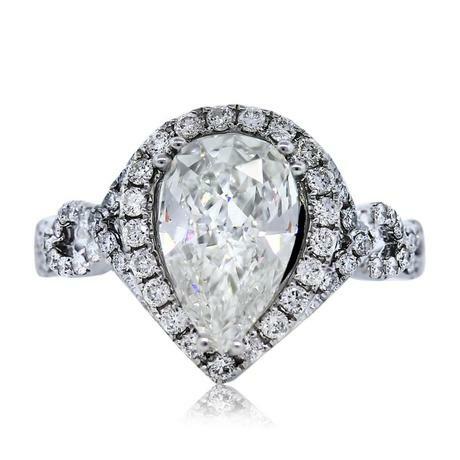 This ring is a GIA Certified H color, VVS in clarity pear shape weighs an impressive 1.70 carats. 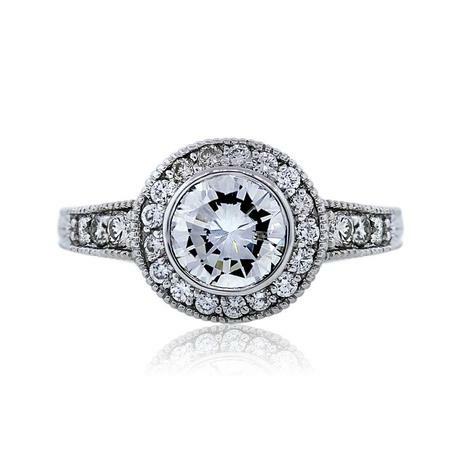 We love the stone’s breathtaking clarity and to add to the sparkle the mounting uses a “halo” of round brilliant diamonds, while the setting is braided and beautiful with even more diamond pave adding up to approximately 1.50 carats total set in white gold. Also getting into the braided setting mix, Simon G. We love this entwined mix of two tone 18kt gold and .58 carats of diamonds. A high quality H color and SI2 clarity ensure excellent quality that you’d expect form a designer engagement ring. Finally, we saved our favorite for last (yes, we totally play favorites). 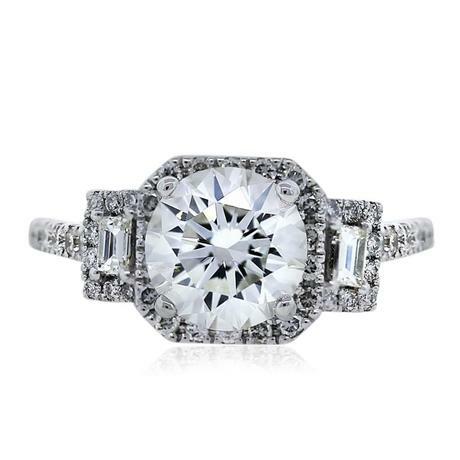 This jaw dropping ring features a vintage style setting that’s completely iced out. In the center, a 1.31 carat GIA certified J in color and SI2 in clarity round brilliant diamond shines like the sun. Set on either side are two baguette diamonds that break up all the brilliant sparkle with some step cut faceting that adds another layer of interest to this engagement ring. Set in 14kt white gold it looks opulent and fit for a princess.